Inxile Entertainment has announced that Wasteland 2: Director’s Cut is now available for Nintendo Switch at retail stores across North America for $29.99 USD / $39.99 CAD. The retail edition will release in Europe on May 17, 2019 for €34.99 / £29.99. 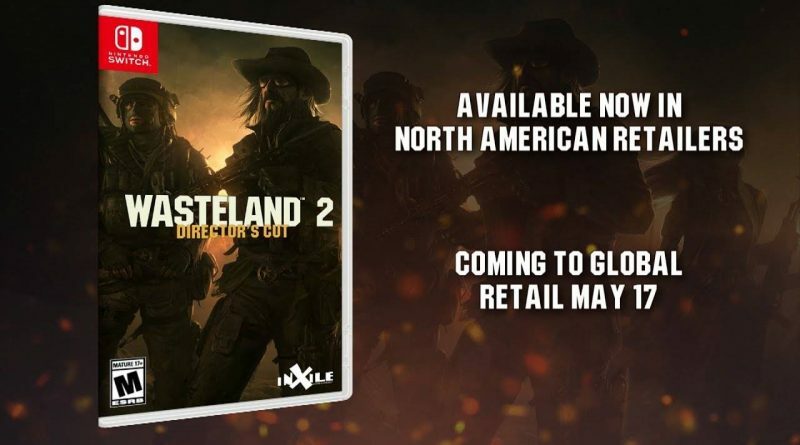 inXile Entertainment, the studio led by Interplay founder Brian Fargo, producer of the original Fallout, has partnered with Nintendo to release Wasteland 2: Director’s Cut, the sequel to the first-ever post-apocalyptic computer RPG. Critically praised and winner of numerous accolades, including Game of the Year, Wasteland 2: Director’s Cut is an enhanced version of the original that features improvements, customizations and additions that further immerse the player in this epic alternative-historical adventure. With more than 80 hours of gameplay, Wasteland 2: Director’s Cutt will test your survival instincts as you traverse across a post-nuclear American Southwest with your Desert Ranger squad. “Many of our fans have old school sensibilities, so when we announced the arrival of Wasteland 2 on the Nintendo Switch, we immediately began hearing requests for a physical version of the game. Many players love the collecting element of games – having the game in-hand, displayed on a shelf, and ready to be plucked off that shelf and played at any moment. We investigated the possibility, and thanks to a partnership with U&I Entertainment, are delivering this physical version of the game for our fans to have and enjoy,” said Brian Fargo, CEO, inXile Entertainment. Wasteland 2: Director’s Cut is available now for Nintendo Switch at North American retailers including Amazon, Best Buy, GameStop and Target for $29.99 USD / $39.99 CAD. The retail edition will release in Europe on May 17 for €34.99 / £29.99.